Grandma’s Cat and the Silver Planet is the second in a series of children’s books called “The Adventures of Grandma’s Cat”. It is aimed at children between 7 and 10 years old. In this book, Captain Cat and his trusty sidekick, Astromouse take to their flying milk saucer once again and set off in search of adventure. This time, they get stuck inside a strange silver planet. Can they trust an alien robot to help them escape? 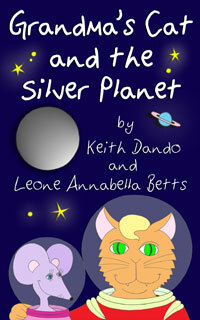 “Grandma’s Cat and the Silver Planet” was released as a Kindle book in mid January 2014. It is priced at £0.99 ($1.31).